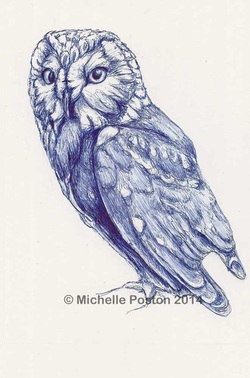 Michelle has always been in love with the art, history and natural environment of the world. Her years overseas with the US Navy exposed Michelle to the cultural arts of Asia and the Middle East, while her training in drawing fiber arts and history have allowed her to understand the process of creating the art. Her artwork is inspired by traditional methods of illustration combined with her own detailed observations and imagination. Michelle enjoys depicting the natural world using her detail oriented skills from fiber arts, while finding the essence of personality each subject has, whether it is animal, mineral or vegetable and then bringing that to the forefront.